Helmed by the English director Paul W.S. Anderson (Mortal Kombat, Resident Evil, AVP: Alien vs Predator, Death Race) Event Horizon is a nightmare inducing ride through a celestial haunted house. Blessed with an amazing cast: Laurence Fishburne, Sam Neill, Kathleen Quinlan, Joely Richardson, Jason Isaacs, and my personal favourite Sean Pertwee and a good multi-written script, the film has no problem selling us the idea of a haunted spaceship. Although, I personally would have loved to see the original 130 minute film before Anderson had to trim twenty minutes of the more spectacular violence out. It is 2047. The crew of the ‘Lewis and Clark’ have been tasked to answer a distress beacon that seems to be coming from another ship, the ‘Event Horizon’ that vanished seven years preciously. A scientist, Dr Weir, has been tasked to join the crew because he was the man who was behind the technology of the Event Horizon. 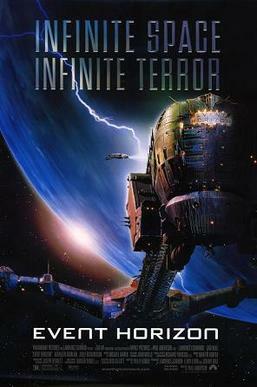 The crew find out that the Event Horizon was capable of creating it’s own black hole. This black hole would enable the ship to travel to the furthest reaches of space. Unfortunately, the first time that Event Horizon used the black hole device, the entire ship and it’s crew vanished. The distress beacon indicates that the Event Horizon has re-appeared. When the crew find the Horizon and board it, they find out that the distress beacon was actually a warning. They also find a ships video log and have to fix it so they can see what happened prior to the ships disappearance. While the crew and Dr Weir are trying to piece together what happened and the status of the Horizon, they all start experiencing things. They soon find out the wherever the Horizon went, the furthest reaches of space was not where it wound up. The ship has returned and brought something terrible with it. This film can almost literally scare the crap out of you. Taking metaphorical pages from Solaris, Legend of Hell House, and yes, even The Shining the film works incredibly well. Even though there are a few blaring plot holes (and to be fair these seem to be the result of the studio enforced editing of some of the gorier scenes to lower the film rating) and the ‘dating’ of some of the FX, the film still has the ability to creep around in your head long after you’ve watched it.